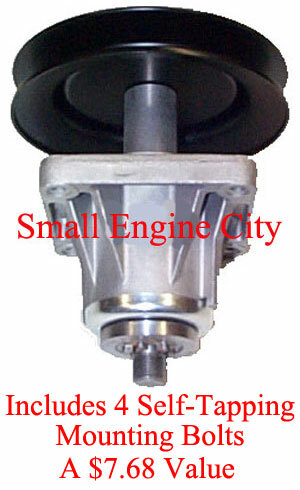 Description: SPINDLE ASSEMBLY CUB CADET Replaces: Cub Cadet 618-0269, 618-0429, 918-0269, 918-0429 and 918-0429A. Fits some 50" Decks. Top Pulley Approx. 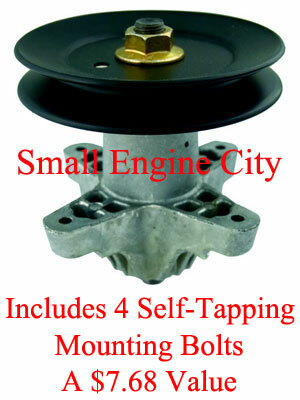 6" and bottom pulley 5"
Aftermarket Spindle Assembly Fits some Cub Cadet model 46 inch Deck 800 series double pulley. Fits star hole blades. 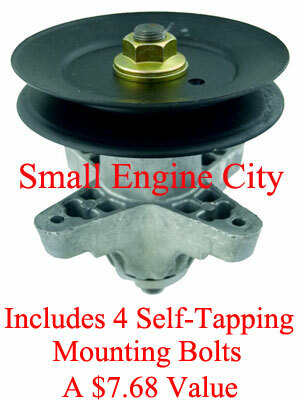 Replaces Cub Cadet 618-0593, 618-0593A, 618-0593B, 918-0593A, 918-0593B, 618-0595, 618-0595A, 618-0595B, 918-0595, 918-0595A and 918-0595B - Includes Double Pulley! Uses nut to hold blade on. 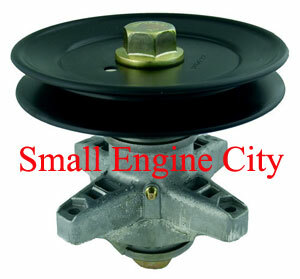 Spindle - Assembly Replaces Cub Cadet 618-0659 and 918-0659. 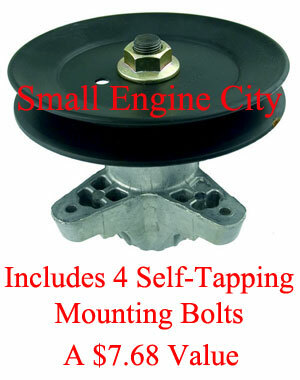 Fits most Cub Cadet LT1040, LT1042 AND RZT with 42" Decks using star hole blades. 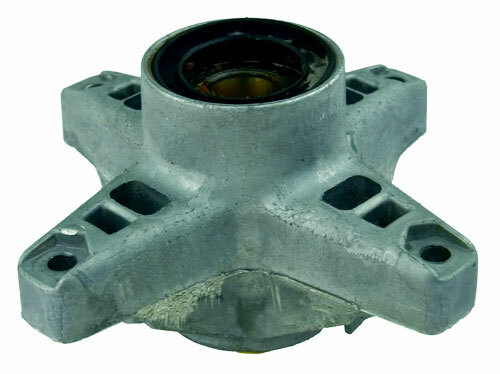 Spindle Replaces Cub Cadet 618-0625, 618-0625A, 618-0625B, 618-04137, 618-04137A, 618-0660 618-066A and 918-0660. Fits LT1045, LT1046, and i1046 with 46" Decks using star hole blades - Has sealed bearings. 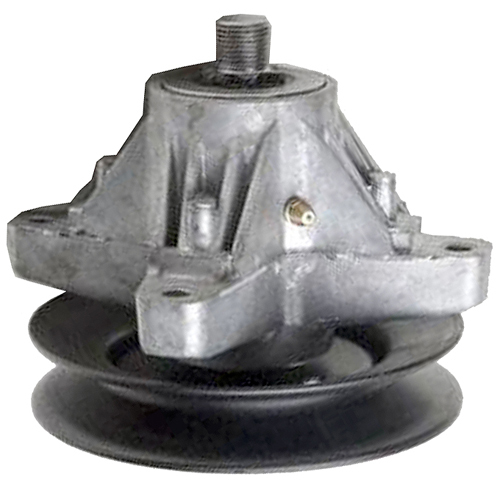 Spindle Assembly Replaces Cub Cadet 618-4123B and 918-4123B. Fits LT Series mowers with 46" Deck using Round Hole Blade. Spindle Assembly must be greased before using. 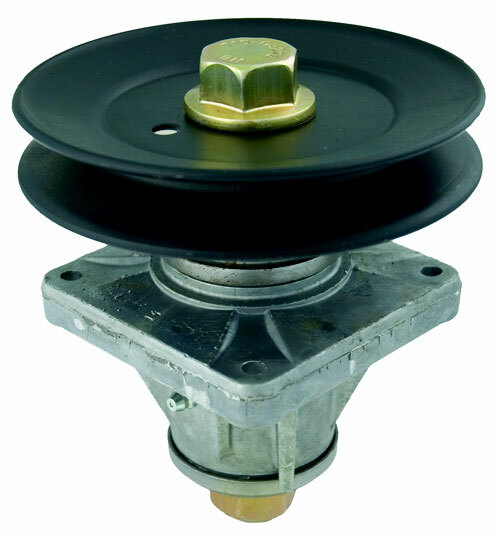 Spindle Assembly Replaces Cub Cadet 618-04124A and 918-04124A. Fits Cub Cadet LT Series mowers with 42" deck using Round Hole blade. Spindle Assembly must be greased before using. Cub Cadet Spindle Assembly Replaces 618-04125, 918-04125B, 618-04126, 618-04126A, 918-04126 and 918-04126A. Fits i1050, LT, SLT, and RZT mowers with 50" deck using star center hole blade. 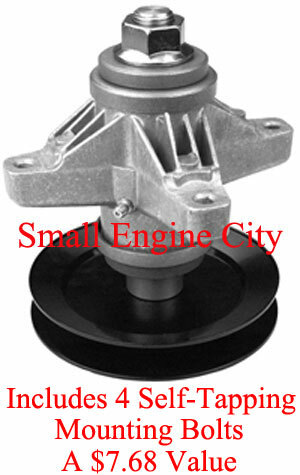 Spindle Assembly Replaces Cub Cadet 618-04129 / 618-04129A / 618-04129B / 618-04129C. 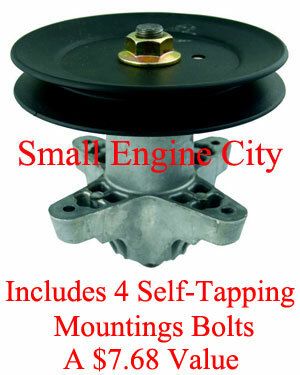 Fits 54" Decks Models LT1024, LT1050, SLT1554 - Requires Greasing before using. 82-407-CU 369 Spindle - Assembly Replaces 618-04461 and 918-04461. 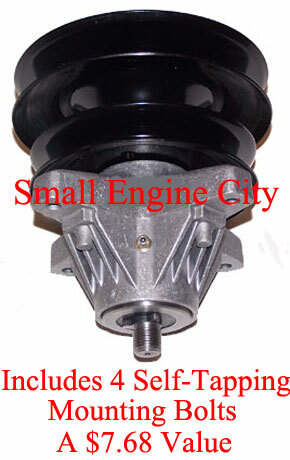 Spindle Assembly Replaces Cub Cadet 618-04461 and 918-04461. Fits Cub Cadet LT Series mowers with 42" deck using star hole blade. 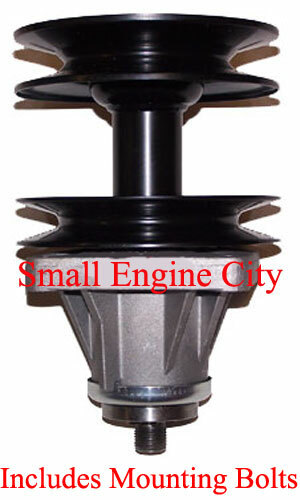 Spindle Assembly Replaces Cub Cadet 759-3665 and 959-3665. Fits Cub Cadet. 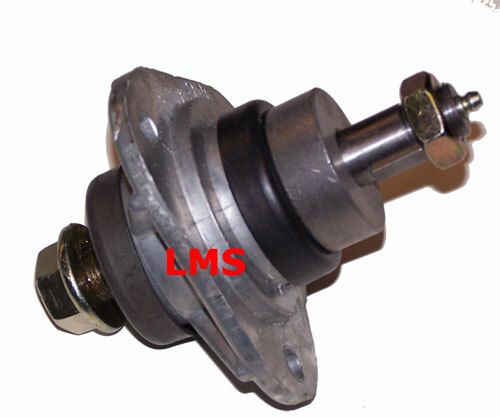 This Spindle Assembly is used on some 2130, 2135, 2140, 2145, 2150, 2155, 289, 299, 300, 301, 317, 320, 324, GT2186, AND GT2521 models. 82-406-CU 369 Spindle Housing Replaces 618-04394 and 918-04394. 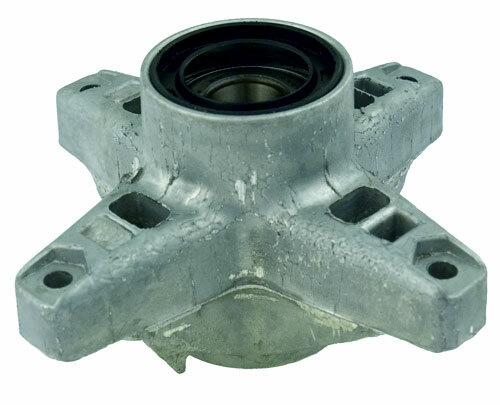 Spindle Housing Replaces Cub Cadet 618-04394 and 918-04394. Fits Z Force, Mowers with 48" thru 60" deck using round hole blade.